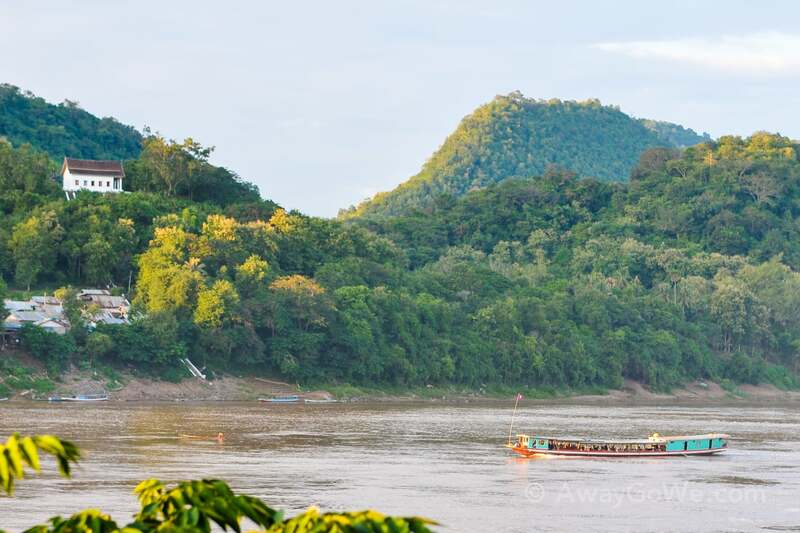 Our two-day slow-boat journey down the Mekong ended at a nondescript boat ramp seemingly in the middle of the jungle. 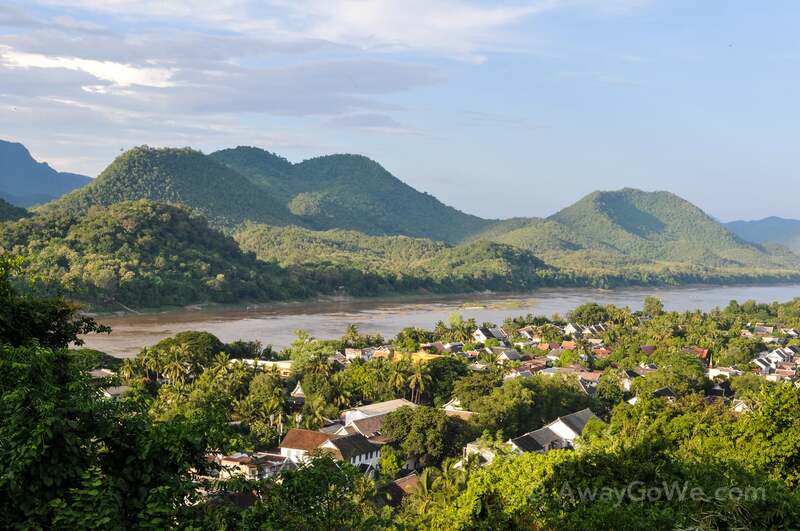 From the banks of the Mekong, the density of the vegetation mask what lay beyond — and this being our first time here, what lay beyond truly astonished us. Disembarking with a large packed boat of other backpackers and visitors, we felt an extreme urgency to secure a room for the next few nights, as it hadn’t been feasible to book ahead of time. 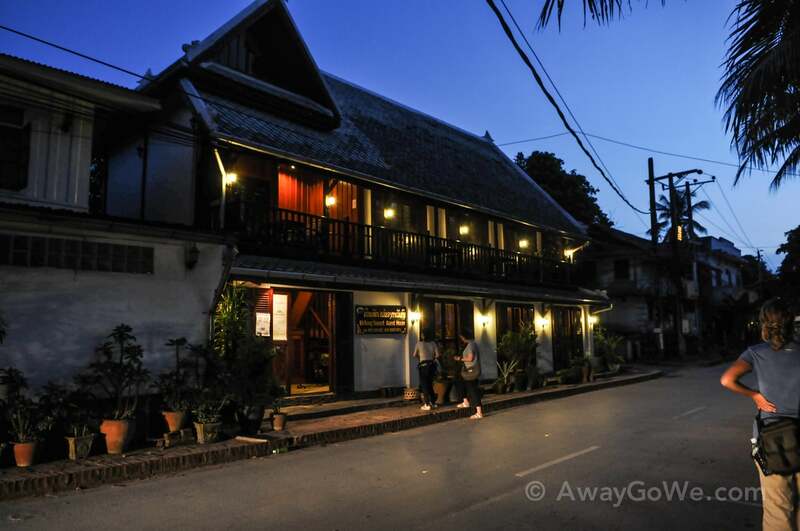 We had carefully chosen our guesthouse from a plethora of online reviews and guidebooks. Did we go a bit overboard? 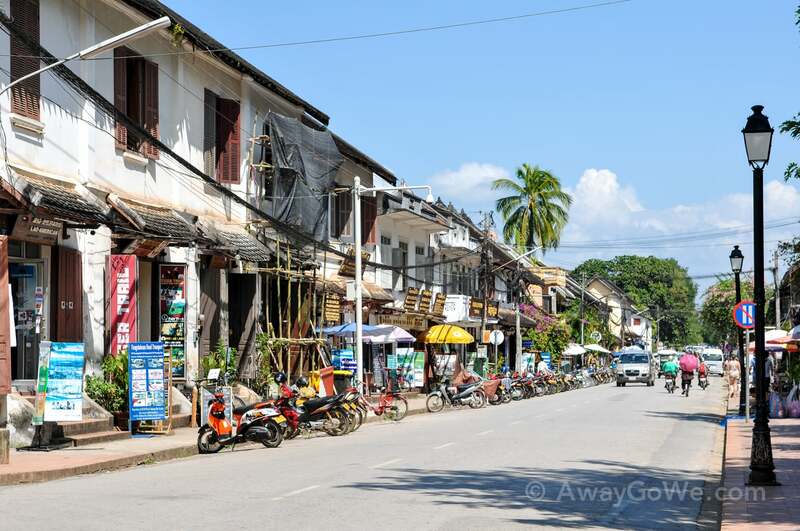 In hindsight, most certainly, as we soon learned Luang Prabang has no shortage of cheap and serviceable accommodation. 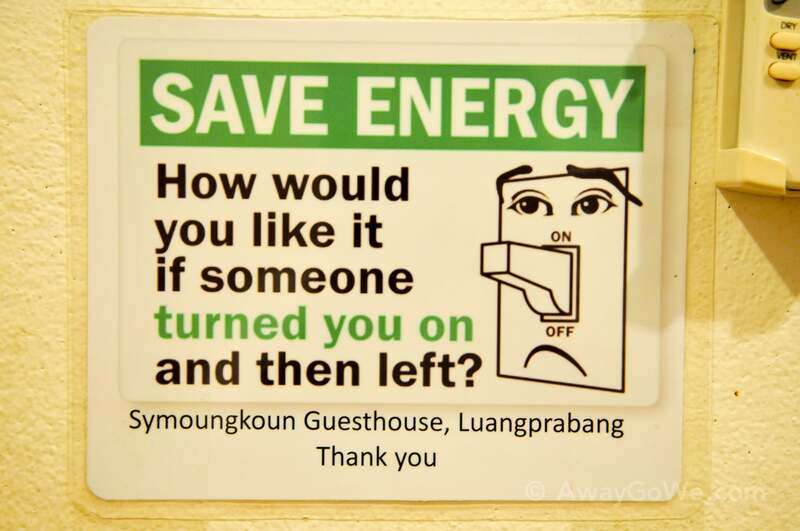 But when you’ve just come off of a month in Thailand, tired of carrying a heavy backpack to fully-booked guesthouse after fully-booked guesthouse in the heat of the day, you too might adopt a similar attitude. So, we beelined it to our chosen guesthouse (Symoungkoun Guesthouse) as fast as our hooves would carry us only to discover that our chosen place had plenty of rooms available. Granted, if we had chosen a place closer to the pier, we might have encountered some difficulty, but this little place — costing about twice as much as a typical backpacker hostel here (~US$18) and a 20-minute walk up into the quiet and charming northeastern end of the peninsula — remained largely overlooked by the hoards of backpackers arriving. 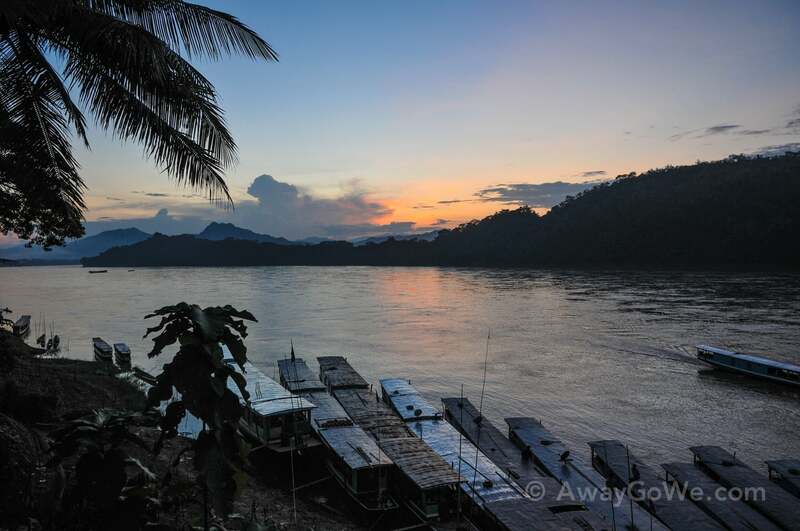 After settling in, we headed back down to the banks of the Mekong for a sunset drink. An absolute magical evening in a magical place with BeerLao and Lao Lao (local Lao moonshine), reflecting on the last two days watching the banks of the Mekong roll by. Few happy-hour experiences compare. How do you follow a memorable happy hour? With an even more memorable dinner experience, of course. 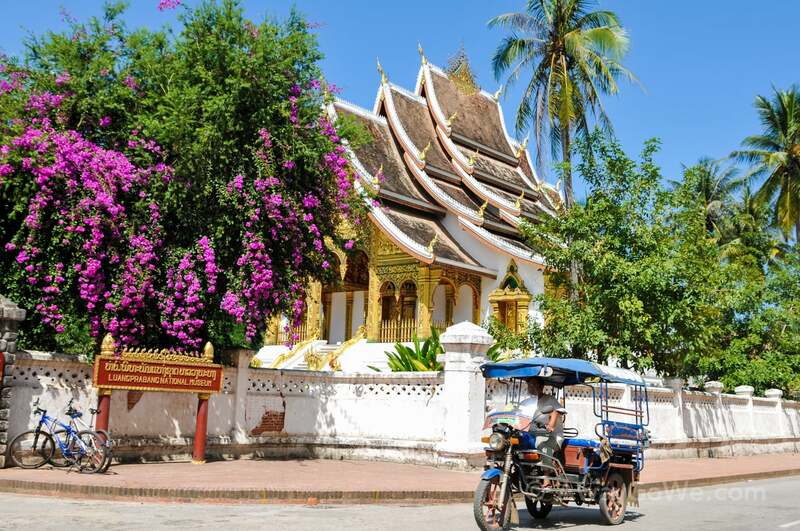 Luang Prabang became a UNESCO World Heritage site in 1995, and, as you might expect, is a truly remarkable town. 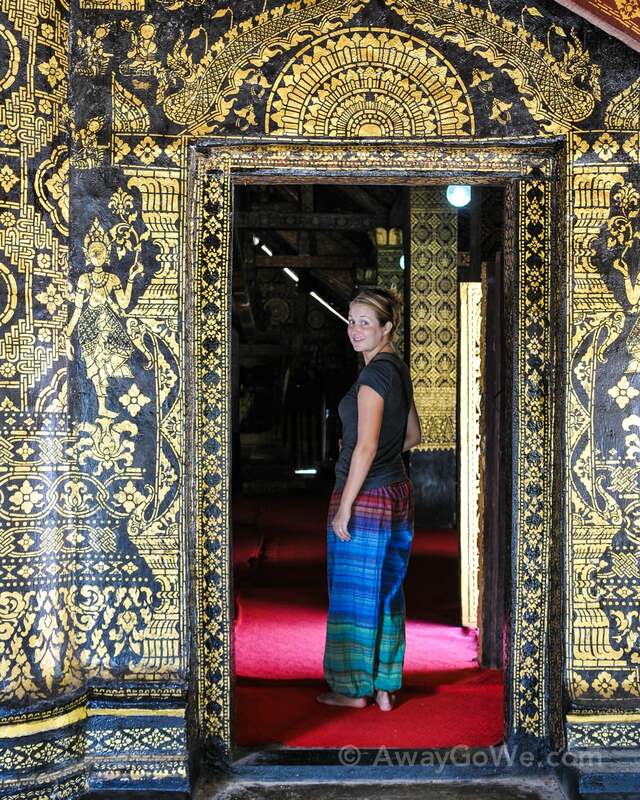 So now we find ourselves in Laos. 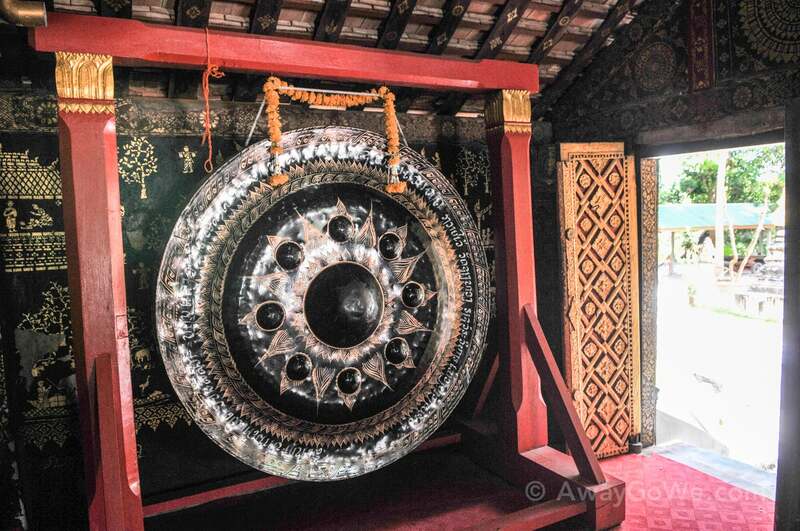 We took the slow boat from the Thai border down the Mekong and ended up here in Luang Prabang, which by all accounts is a surprise indeed. 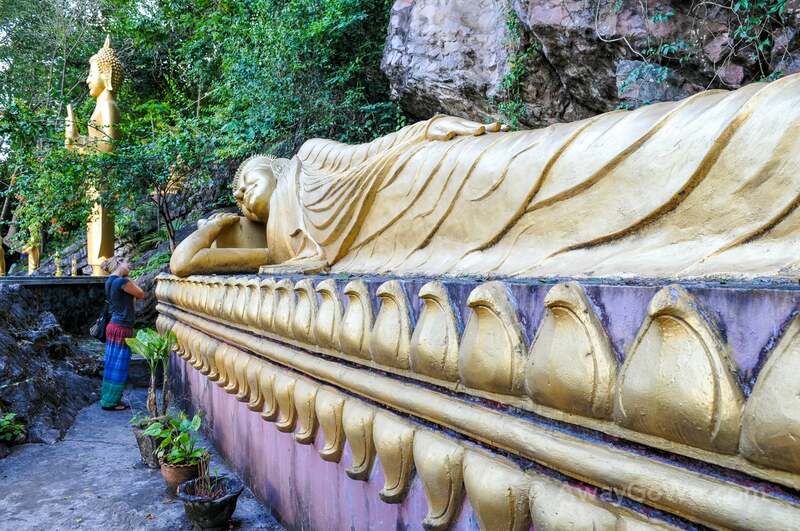 Like a lot of other travelers, we knew very little about Laos before coming here. 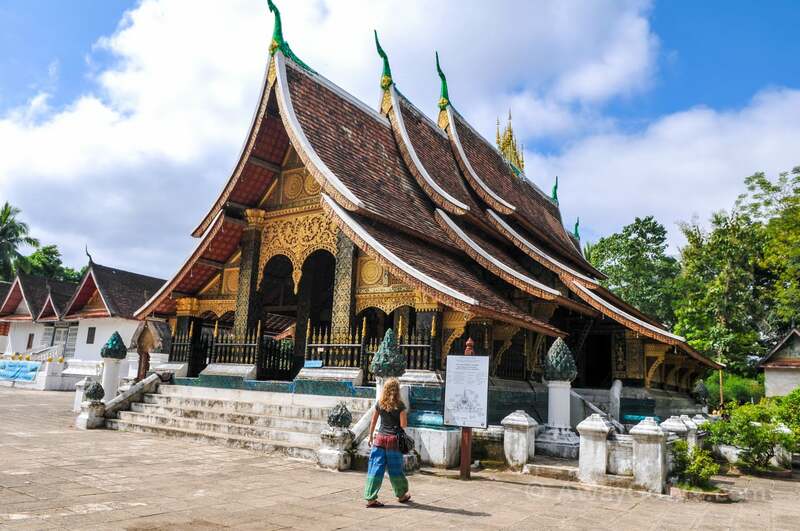 Our expectations were not incredibly high given Laos’ complicated history and relative obscurity. But what a relaxing and breathtaking place. 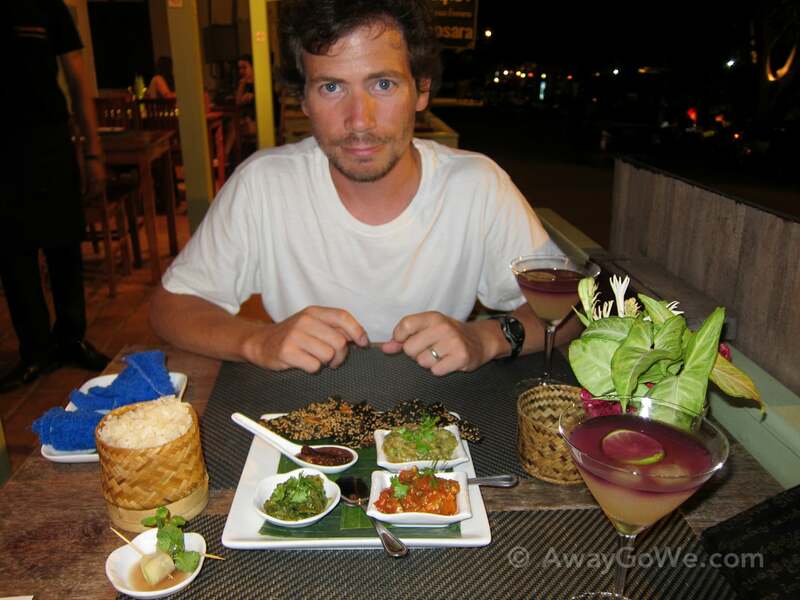 Everyone Laotian we’ve met has been incredibly kind and seemingly sincere. 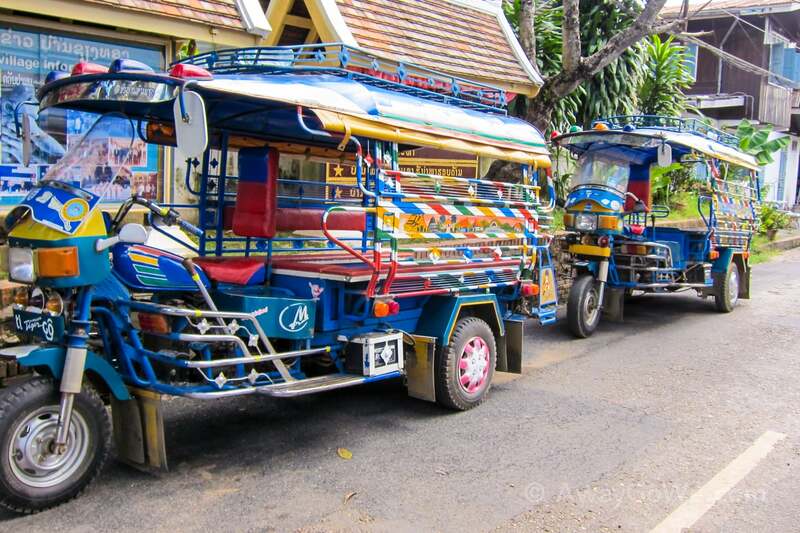 Even tuk-tuk drivers are courteous. 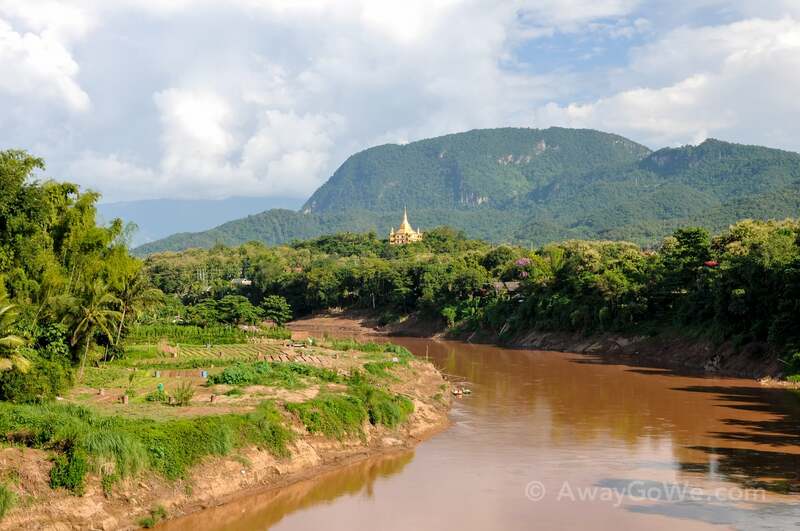 The scenery is amazing too — lush green hills, redish brown hillsides and the mighty Mekong. 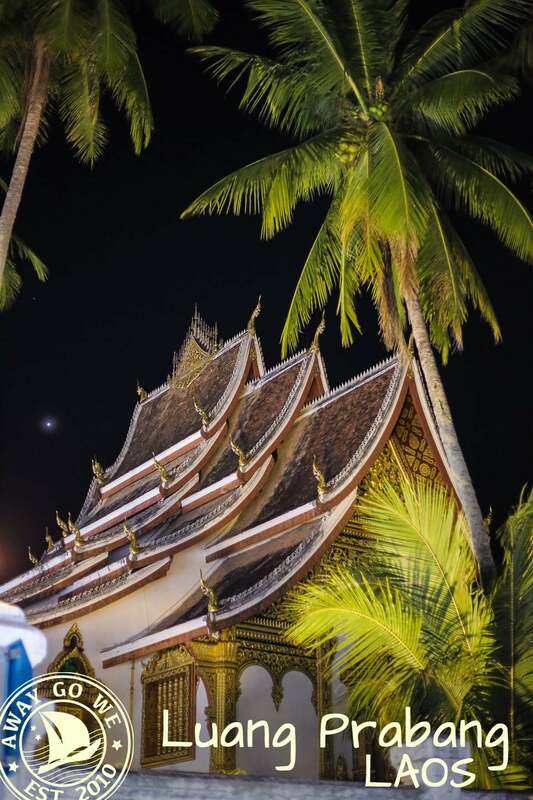 And Luang Prabang is quite the surprise as well. 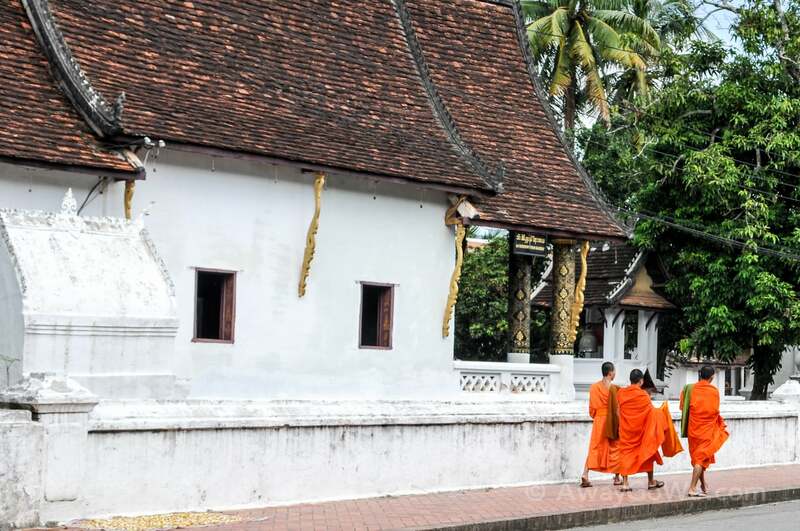 We’re staying in the historic section near the famous alms-giving temple. It’s one of the most peaceful and quiet places we’ve visited on our entire trip. 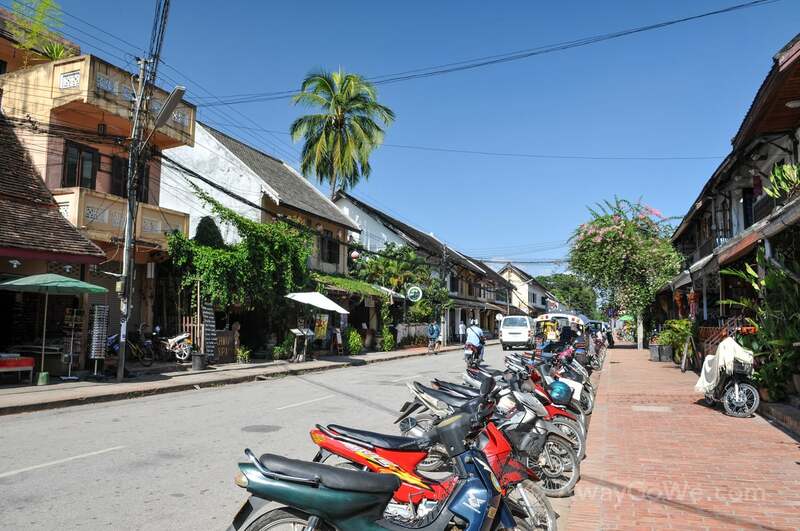 The roads are lined with French-influenced guesthouses and restaurants, brick sidewalks and Tamarind trees. Local children play in the streets in the evening and you can stroll around old town free of hard-selling touts, save for the low-key woman on the street corner asking “Massage madamme?” or the random sketchy Lao dude passing you on the street whispering “waterfall tour, smoke-smoke, joint?” right outside of the boutique artists gallery and bookshop. 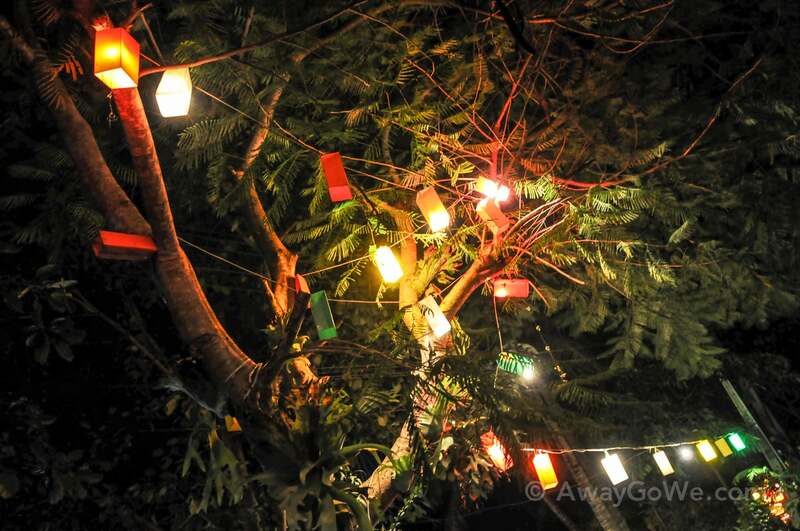 In Luang Prabang, we discovered JOMA Cafe, a fantastic local little chain started by two Canadian couples. 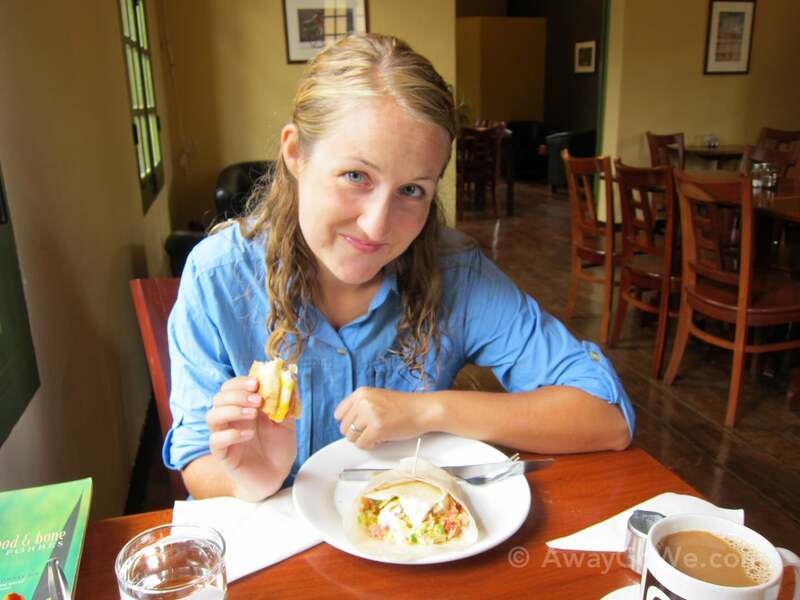 They serve up delicious coffee and Falang favorites that we haven’t found anywhere else in the region, like bagels and lox, Mexican wraps, and leafy salads. Today, we’re sharing a breakfast burrito and egg & cheese bagel sandwich in their quiet (and air-conditioned) second floor space. 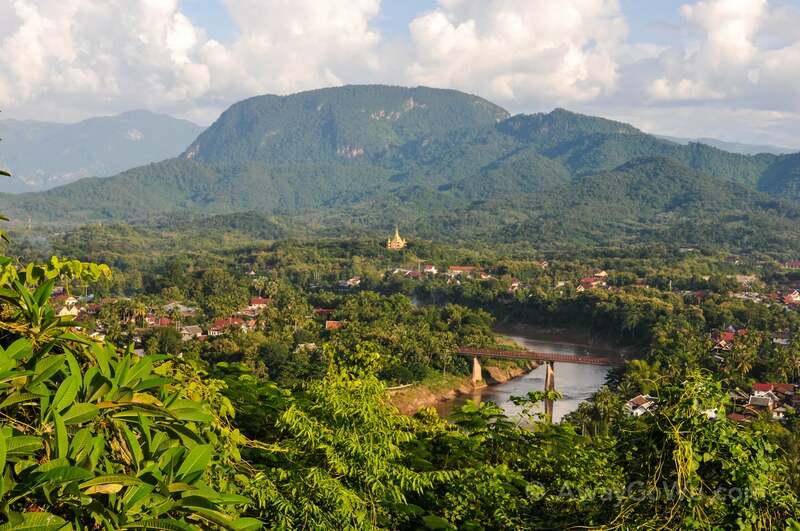 Luang Prabang is also unique because tourism is largely contained to a small peninsula formed by the Mekong and Khan rivers. Traditional life continues just across the river much as it has for a very long time. 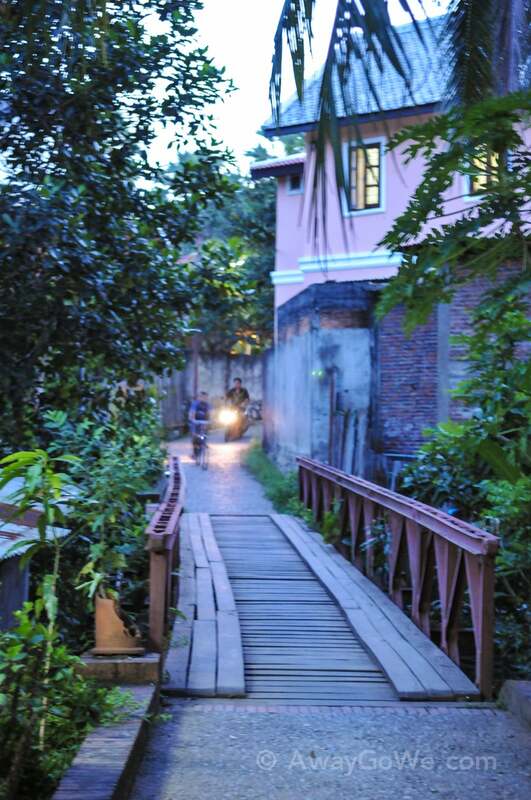 There are only two permanent bridges that cross the smaller Khan River — the old bridge (below), and the new bridge. 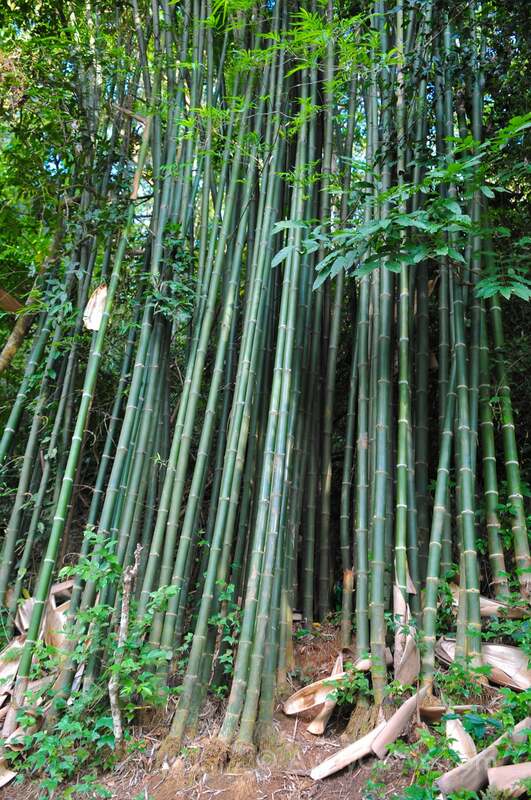 In the dry season 1-2 bamboo bridges are constructed to connect the two sides as well. 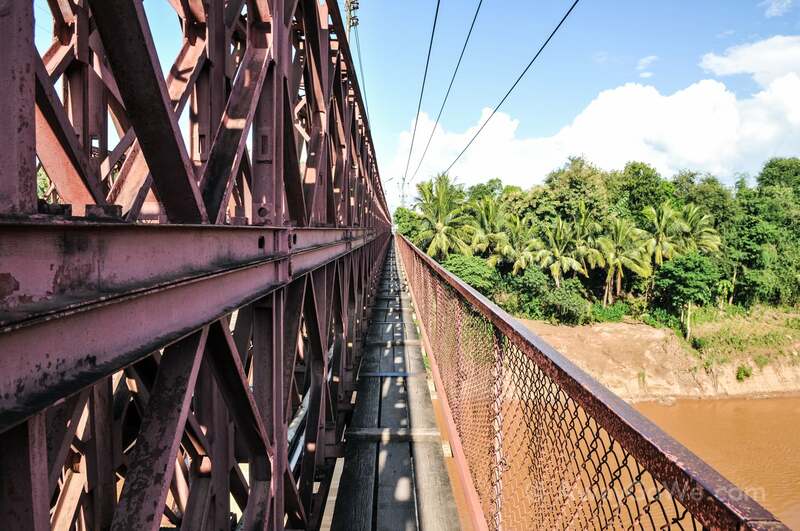 There are no bridges in town that cross the Mighty Mekong (and only a small handful across the entire country). However, dozens of boats and ferries of all sizes still connect the two sides of the river. 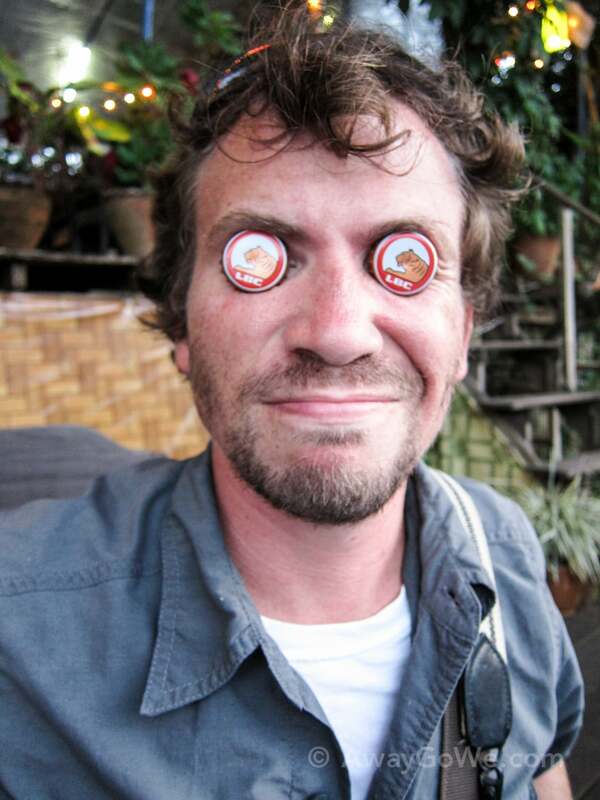 A few too many BeerLao, perhaps? 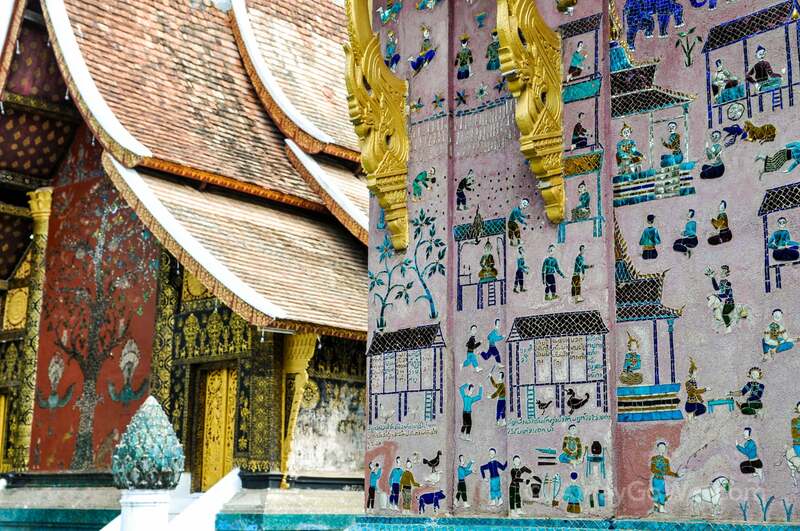 Luang Prabang was its own kingdom for centuries until very recently. 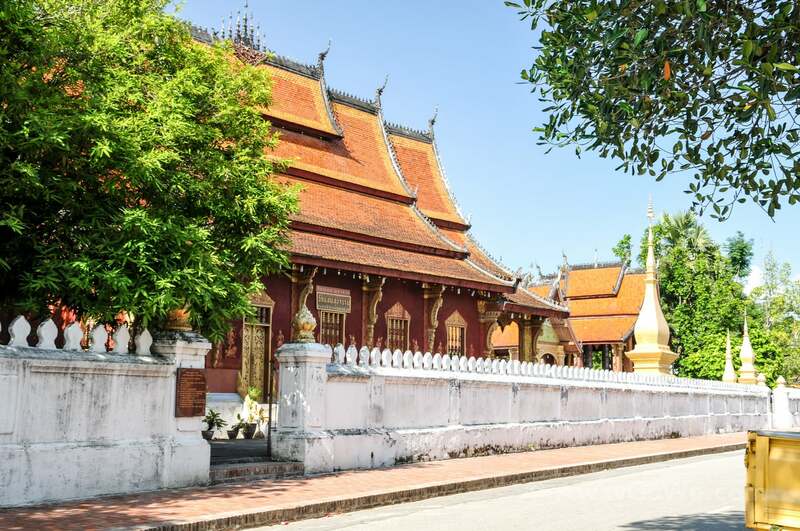 When the French annexed the country, they recognized Luang Prabang as the royal residence of Laos, and when Laos gained independence, the king of Luang Prabang became the head of state of the Kingdom of Laos, ruling until communist forces seized the city in 1975. 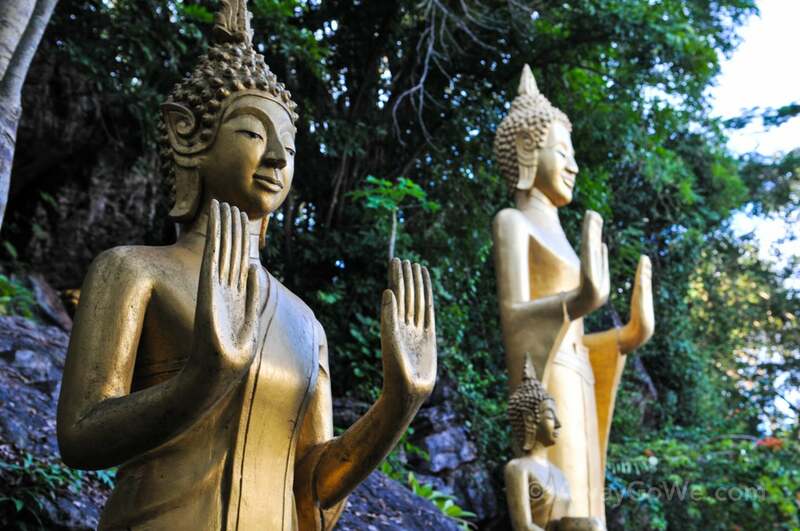 As such, the city has long been the site of numerous significant temples and in many ways, today still serves as the spiritual epicenter of the country. 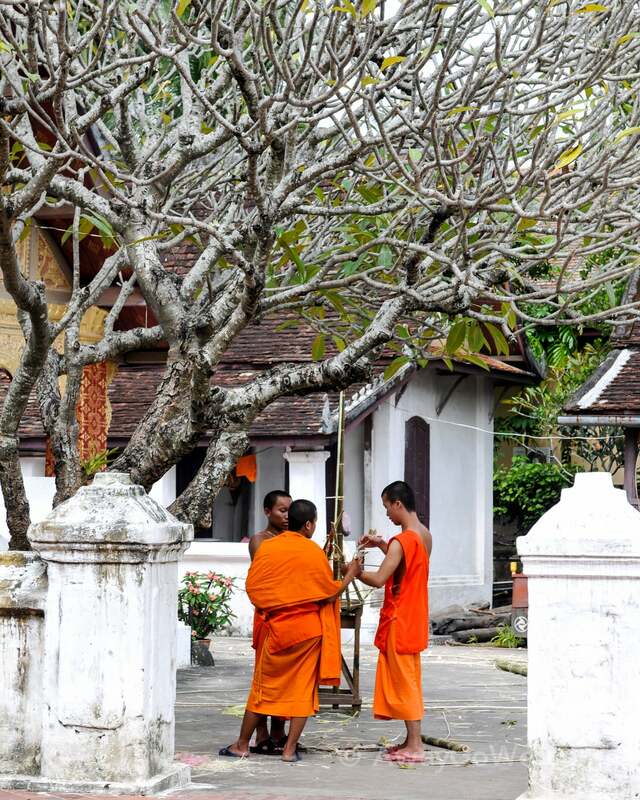 Consequently, saffron-clad monks are a common sight throughout the city. 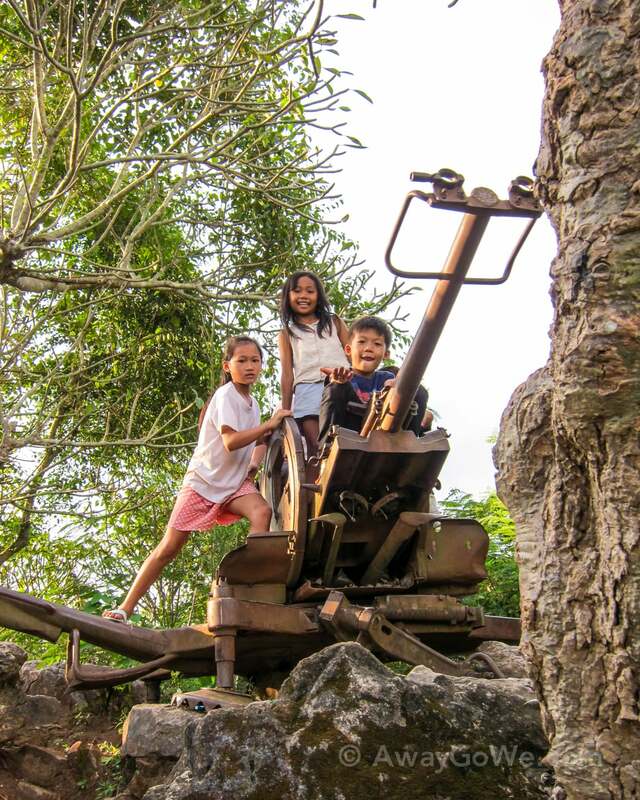 A climb up 500-ft. Phou Si is a highlight of visiting the old quarter. 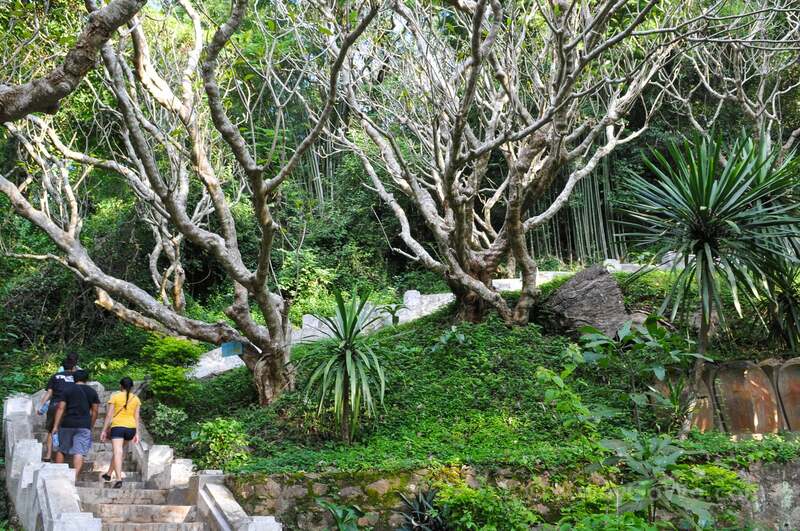 300+ steps gets you to the top where you are rewarded with commanding views of the city and surrounding mountains. Even in the center of town, reminders of a devastating and not-so-distant past still linger, though the scene today contrasts starkly with that of a couple of generations ago. 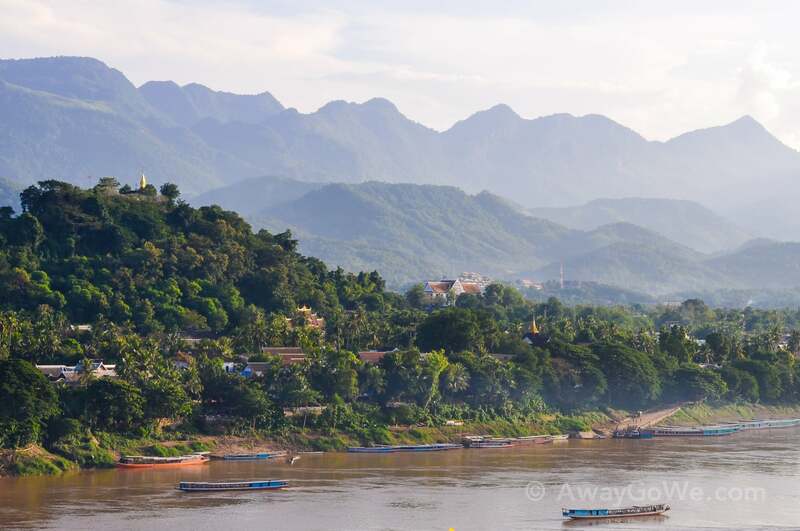 To the northeast, mountains, the Mekong, and a picturesque view of the UNESCO heritage quarter. 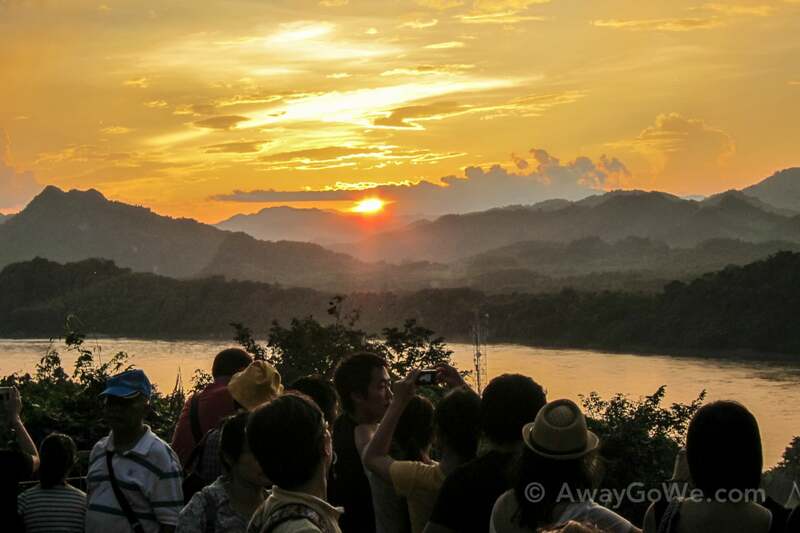 And now for what really compels visitors to climb the 300 steps to the top of Phou Si, the awe-inspiring sunset view. Yep, it gets a bit crowded at the top around this time, as you might imagine. 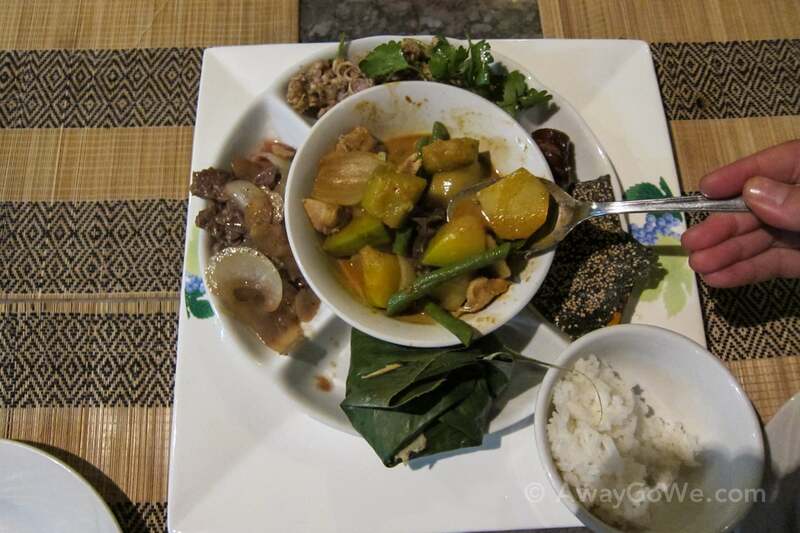 And of course, another tasty Luang Prabang-style Lao dinner at Cafe Toui.